Not really. Sadly, the Lucky Country is in the middle of a monster drought which shows no signs of letting up any time soon. It's also apparently willing to elect a man who can't accept that calling for a "final solution" to migration could be taken at least two different ways, and it's also a country where the government is so pig headed it won't accept that it can't legislate its way out of encryption. This government, you may remember, is the same one that thought it was OK to not pay too much attention to personal health records and made a bit of a pig's ear out of that process. Well the same people have brought you a new law (the Assistance and Access Bill) that ensures the government doesn't just have a back door into your private data, it has the front door as well. IT providers, ISPs and oh pretty much anyone you can buy a service off has to conform to the law and hand over anything you might have stored there if asked for it. They also face fines if they tell anyone that the government has asked for the data. Still, if you've got nothing to hide you'll be fine, eh? The law presumes that anyone who wants to secure (or "hide") data must have some reason for doing so and those reasons don't extend to "it's none of your business" or "it's my client's data" or "it's personal" but rather start and stop with "I'm a criminal, come at me". 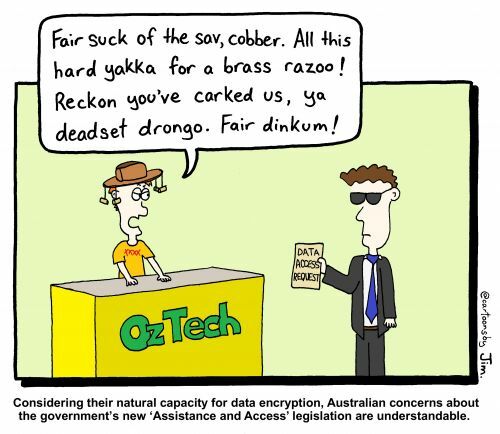 The upshot is, anyone doing business with a company based in Australia should be very cautious about what materials it shares with the Australian business because as it stands they may well have no recourse but to hand it all over to an Australian government official with little or no regard for the real ownership of that data. And just to reiterate the main point: it's not about having something to hide, it's about having control over your own personal information. I don't have anything to hide, but I also don't share my bank account number online. I don't have anything to hide but I close the blinds when I go to bed. I'm not hiding anything, I am enforcing my right to privacy and to decide what I will share and when. In Australia, you aren't quite so lucky. Speaking of rights, last week's discussion about what is and isn't free speech isn't getting old any time soon. Twitter has yet to figure out quite what it's doing about polarising accounts that may or may not abide by the social media company's terms and conditions, but that hasn't stopped it ditching a whole bunch of robot accounts. Many users have noticed the number of accounts that follow theirs has dropped sharply (this editor kissed goodbye to 85 such followers) but it's not a sudden chilling effect brought on by the communists in charge. No, it's a clean out of fake accounts that have been set up for various reasons. Some are pretty benign - they beg you to click on a link to see some product or other that you might wish to purchase. But others are more of a problem. Spouting fake news, lies, defamation and other indignities, or worse, offering you content that is illegal or contains viruses or other security breaching baddies just to keep you on your toes. Twitter is also in the throes of working out just what it is and how it will operate and that's proving to be something of a problem for any third-party apps that connect with Twitter because the parent company is clamping down on how these apps connect with the mother ship. The problem is, these apps generally offer the kinds of functionality that users want to see. Chronological ordering. Advanced search capability. The ability not to see the ads that Twitter believes are its lifeline. That's lead to Twitter acting and instead of saying "these are all features users want, we shall embrace the user and build this features into our own offering" they've said "these are features users want but which we don't want to offer, we shall ban them" and that's pretty counterproductive. Twitter is different from Facebook and Instagram and all the other social media platforms and there's a reason why that's a good thing. Making Twitter into Facebook Lite isn't going to work as a service because the users don't want Facebook Lite - they want Twitter. The problem is that Twitter has no business model. Nobody will pay for ads if the users can avoid them and so Twitter feels obligated to force users to watch them. And we're not just talking "Buy Burma Shave" ads - those I would actively seek out - but rather paid, placed tweets that may or may not look like advertising. Users do not want this disruption to their timelines. They don't want to see materials from people they don't follow pushed on them. They do want to see tweets from those accounts they do follow and they want to see them in chronological order, but sadly that may not go on for much longer. All of which is a crying shame because Twitter is incredibly useful, and is a source of great amusement to me. But if it goes, it goes and there will be something else I am sure. Nothing is forever, whether it's a bot or a service, and life carried on for many years before the advent of social media - I'm sure we'll do just fine without it. Alleged dirty rotten ticketing shysters, Switzerland-based Viagogo has been the bane of many people buying tickets online for some time. The site has done a great job of securing the top spot in just about any search for tickets to shows and manages to lure in unwitting customers, many of whom subsequently complain of being fleeced, charged more for the tickets than the venue charges, added on hidden fees, not had GST or other duties disclosed until too late and often they allegedly don't even actually have the tickets it says it's selling you. I've just gone online to buy tickets to see Bill Bailey next month and got suckered in by Viagogo's top spot listing, but thankfully my ESET firewall said "thou shalt not click" and stopped me from doing something stupid, like giving them money. I'm not alone - the Commerce Commission has revealed it has received more complaints about Viagogo than any other company in New Zealand - even the telcos! And on top of that, it's also going to sue the publicity-shy company, and has launched proceedings in the High Court for breaches of the Fair Trading Act. The company faces similar action in parts of Europe and even in Australia. This is not a concerted effort to block Viagogo's right to say whatever it likes either, by the way. This too is not a free speech issue but is, rather, about not telling lies when you advertise products (or when you talk about vaccines or the Holocaust for that matter) and so yes, I'm all in favour of them being taken out and slapped around until they start to behave in a civilised manner. Given they're based outside New Zealand, this is also going to be an interesting test case of the Commerce Commission's powers to regulate a company that is outside New Zealand but selling into our fair land.